Ninhydrin’s test is used to indicate the presence of amino acids in a substance. Ninhydrin solution is used to detect all types of amino acids. Ninhydrin (2,2-Dihydroxyindane-1,3-dione) is a chemical compound that is used to detect the amine group in the amino acids molecule. Amino acids react with ninhydrin to form an aldehyde and release NH3 and CO2. Hydrindantin forming after ninhydrin has reacted with amino acids. 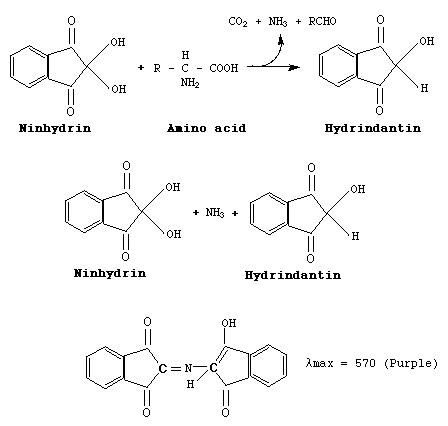 Hydrindantin and other ninhydrin molecule will react with NH3 released by amino acids to form purple color molecule. Positive results is characterized by changing color of solution into purple (yellow for prolin). Ninhydrin + amino acids = hydrindantin (change of ninhydrin) + aldehyde + NH3 + CO2 (fragments of amino acids). Put 2 ml substance to be tested in a test tube. Add 5 drops of 0.1% ninhydrin. Heat in a water bath for 10 minutes. Observe the appearance purple color. Ninhydrin test used by the police to show fingerprints left at crime scenes. Sweat issued containing amino acids, so it can be detected by ninhydrin. Sweat attach to a surface with a special pattern in accordance with scales finger owners. Police will be spraying a solution of ninhydrin in touch objects so the fingerprints will shows purple color.